Universal has big plans for their stable of classic movie monsters, specifically beginning a "Universal Monsters cinematic universe" a la Marvel. 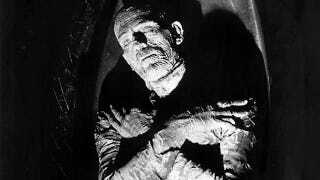 And the studio has announced it will begin with Universal's Mummy: The First Monster, to be directed by Alex Kurtzman, and due out in 2016. Kurtzman, best known for partnering with Roberto Orci on the Trek movies, Transformers movies, and about a billion other things, will also write the script. Universal says the movie will have nothing to do with the Brendan Fraser movies, and, despite the movie's title — which is amusingly close to Captain America: The First Avenger — will have a contemporary setting, so when they say "first" I assume they're counting when the Pharaoh first got wrapped up back in ol' Ancient Egypt Times. I mean, if the Mummy only has a head start of a year or two on Dracula or Frankenstein's monster, the "first" isn't nearly as impressive, is it?